INTEGRAL is a European (ESA) Gamma-Ray Observatory Satellite Mission for the study of cosmic gamma-ray sources in the keV to MeV energy range. It was launched on 17th October 2002 and will be operated till at least 2012 or beyond. INTEGRAL has two main instruments, the Imager "IBIS" and the Spectrometer "SPI". 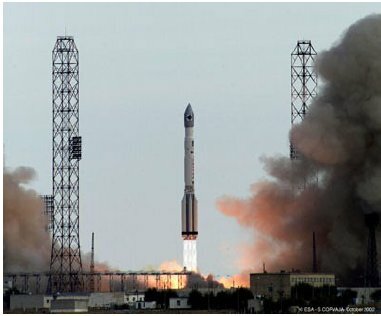 INTEGRAL was launched with a russian PROTON launcher from Baikonour/Kazachstan. The PROTON launcher injected the satellite into a transfer orbit and INTEGRAL's own propulsion system brought the satellite into its 72 hours eccentric operational orbit with an apogee of 153600 km and an inclination of 52.5 degrees. More details on ESA website dedicated to INTEGRAL mission.